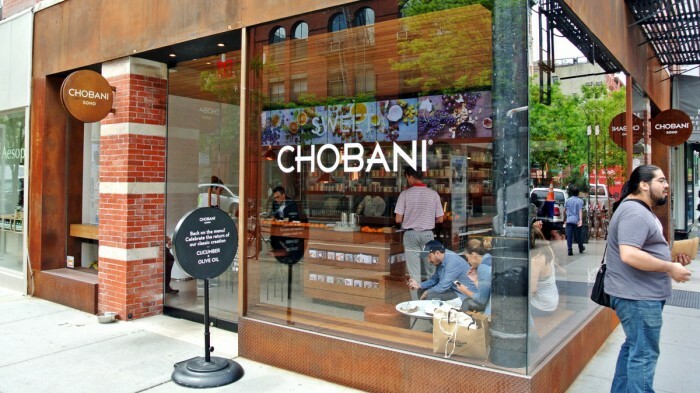 In a neighborhood where models, fashionistas, and shopping enthusiasts roam wild it’s almost unsurprising that a cafe like Chobani exists. I’ll be the first to admit that I openly scoffed at the idea of a fresh Greek yogurt specialty shop when they first opened up in SoHo, but I’ll also be quick to tell you that everything is actually incredible. You, like me, are probably saying “Really? It’s just Greek yogurt with toppings in a bowl?” Well yes, that would be the simplistic way of looking at it. 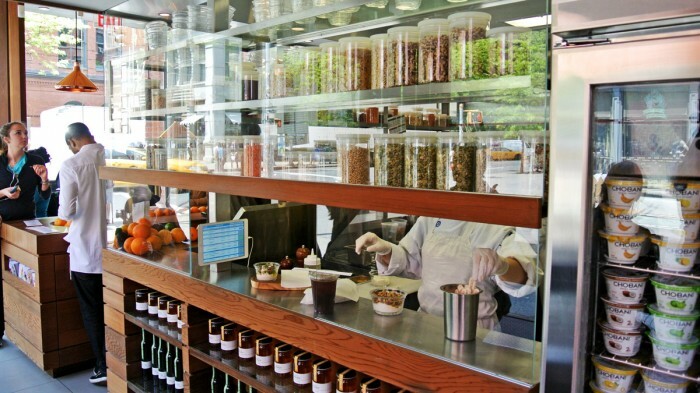 But, there are actual chefs back there behind the glass wearing actual chef coats putting together super-fresh, interesting, flavorful sweet and savory Greek yogurt and gourmet topping combinations. Though you’ll spot model-types in there getting a small yogurt and an espresso and calling it lunch, you can also definitely create a satisfying and substantial lunchtime meal out of their offerings. 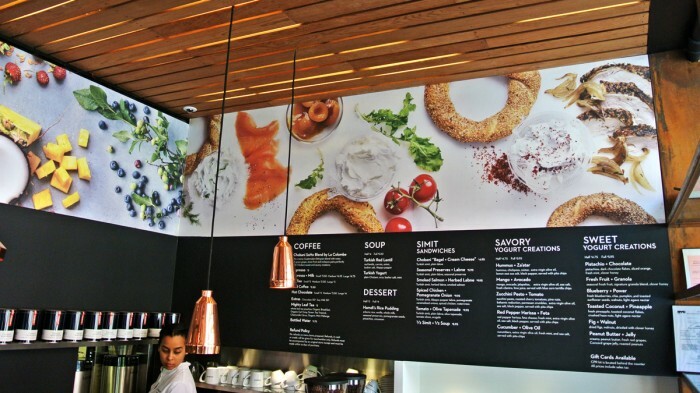 To expand upon their gourmet Greek yogurt selection, they recently added an array of sandwiches called Simits to the menu. For those unfamiliar with a Simit, it’s a ring-shaped and often sesame seed covered Turkish bread not too dissimilar to a bagel. The ring radius is usually much thinner and the center hole much wider, but the rest of it principally remains the same. My favorite way to go about lunch here is to go with a dining partner and order two simit sandwiches and one large yogurt. 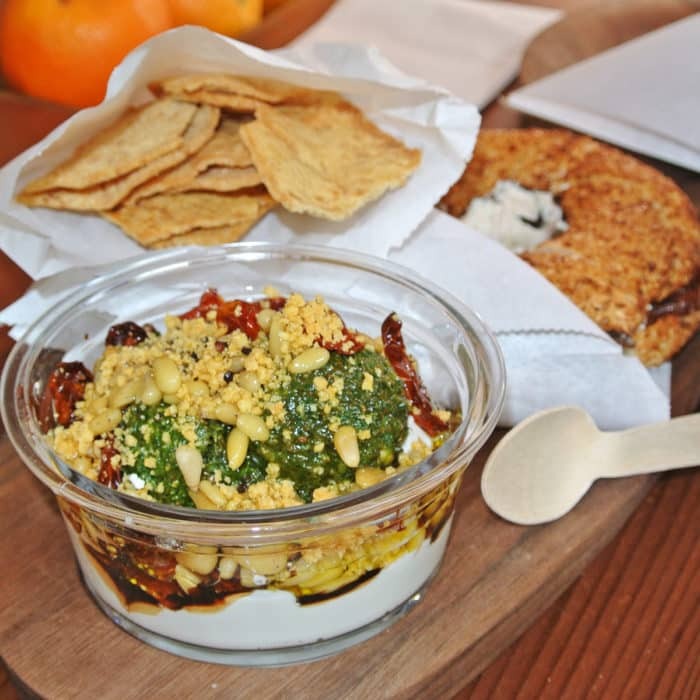 After meeting Amy at the shop on our lunch breaks, we chose the Zucchini Pesto + Tomato Savory Greek Yogurt as our bowl to share. The serving size of the “full” is pretty substantial and I’m always unsurprisingly drawn to the savory topping choices offered. Everything I’ve tried so far has been outstanding and this flavor was no exception. 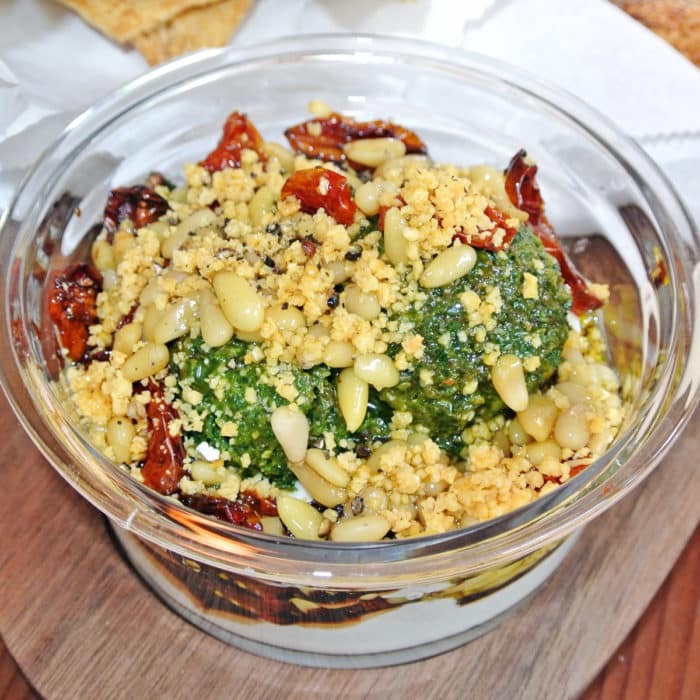 The rich, creamy Greek yogurt was loaded up with a vibrant, herbal, neon green, zucchini-based pesto sauce, roasted cherry tomatoes, fragrant pine nuts, balsamic reduction, parmesan crumbles, extra virgin olive oil, sea salt, and black pepper. This yogurt ended up being more like a creamy dip than a standard bowl of yogurt and came served with a bag of crispy pita chips for dunking. Every bite was bold and complex and I believe worth every cent it costs for that bougie yogurt. To transform our yogurt stop from just a snack into full blown meal, Amy and I each ordered a Spiced Chicken + Pomegranate Onion Simit Sandwich. 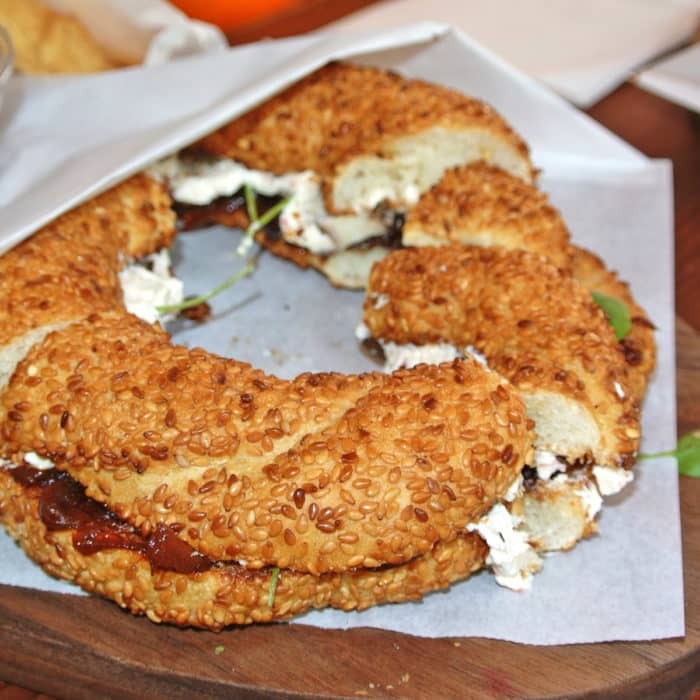 As I explained earlier, a simit is essentially a Turkish bagel and this particular sandwich was served pre-cut into four neat quarters and was topped with aleppo pepper labne, pomegranate caramelized onions, spiced chicken, and watercress. The Aleppo Pepper Labne was sort of like thick, spicy cream cheese, the pomegranate caramelized onions added a chewy, funky, sweetness, and the spiced chicken was cooked well and had a beautiful dark spice-crust on its exterior. The whole sandwich was absolutely delicious and paired well with the savory yogurt dip we had ordered with it. 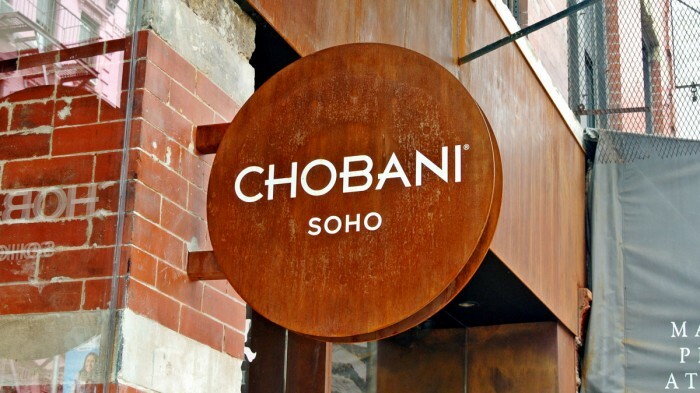 So if you’re in the SoHo area and are looking for a light, fresh, and flavorful lunch, throw your preconceived notions to the wind and give Chobani a shot. It may seem like silly yuppie food, but everything is so damn good I can’t really fault them for it. 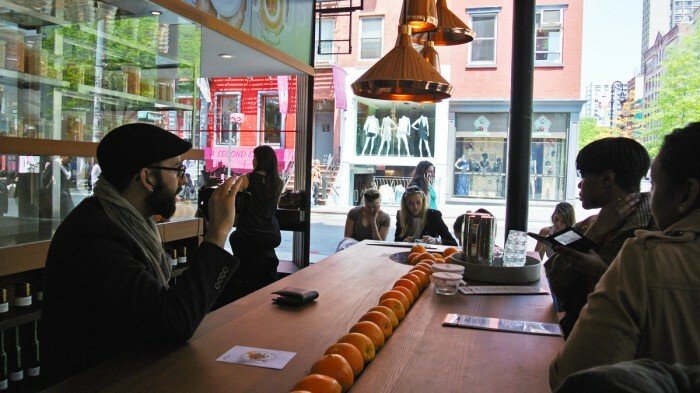 Got another unexpectedly great NYC lunch spot? Let me know in the comments below.